“I work to support the habit” has escaped my lips on more than one occasion. I started young, nine, maybe 10 years old. Influenced by my cousin, I tried it down in the basement a few times. Makeshift paraphernalia set up on my dad’s workbench, then carefully cleaned up so as not track any evidence around the house. I thought it was just innocent experimentation. Then the cravings started. It wasn’t easy sitting in a 5th grade classroom when your stuff was waiting for you at home. The fantasizing was relentless. My friends weren’t sure what to say when I told them about it, or especially the money I was spending on the baggies of goods. It was becoming an addiction, and my parents, once they saw the fervor with which I took to it, couldn’t have been more encouraging. They took me to get supplies and my Dad even went with me to learn how to do more- true bonding. Like weed to a career psychedelic tripper, bucktail streamers were my gateway experience. As a kindergartner trying to mimic a Picasso proudly runs off, paint still dripping, to excitedly show their parents the sloppy results, so was I in trying to copy streamer patterns out of LL Bean catalogs. I’d run through the house, barely-tied in materials flaking off the “fly” with each breezy step. Amorphous rainbows of brightly-dyed fibers accented everything fabric-covered. I employed my raggedy department-store scissors and Mickey-Moused little bench vise to style the sewing thread-and- under-the-bird-feeder plumage-onto hooks. Nothing stayed on. The half-hitch, never mind the whip-finish, all but eluded me. My shedding work was confined to the basement. Then came Santa. In high school I had developed an intense shyness, and to avoid having to socialize I focused on solitary activities. Thus came my second wind of fly tying enthusiasm. Who needed friends when you were knee-deep in dead animal body parts? It was during this upswing in fly-tying activity that I discovered Joe Bates’ Atlantic Salmon Flies and Fishing at the local library. Opening to the color plates was a paralyzing, religious moment. All systems were down. When I came to I was tying a “Lady Amherst” on a Mustad 36890 salmon hook for my parents as an Easter Gift. It still sits atop a shelf in a glass dome encased in a wobbly-engraved, wooden base. At the outset I never thought I’d be able to tie like “those guys” and years later I found myself tying at shows, surrounded by revered fly tying figures coast to coast and overseas. I’ve been featured in magazines, books and numerous websites. I went on to win competitions including gold medal in the 2005 Irish Open for my “Boyne Supremacy” and the 2010 Helsinki Spey Clave. I am no different than others in what attracted me to salmon and steelhead flies. They’re beautiful and mysterious in their own way. 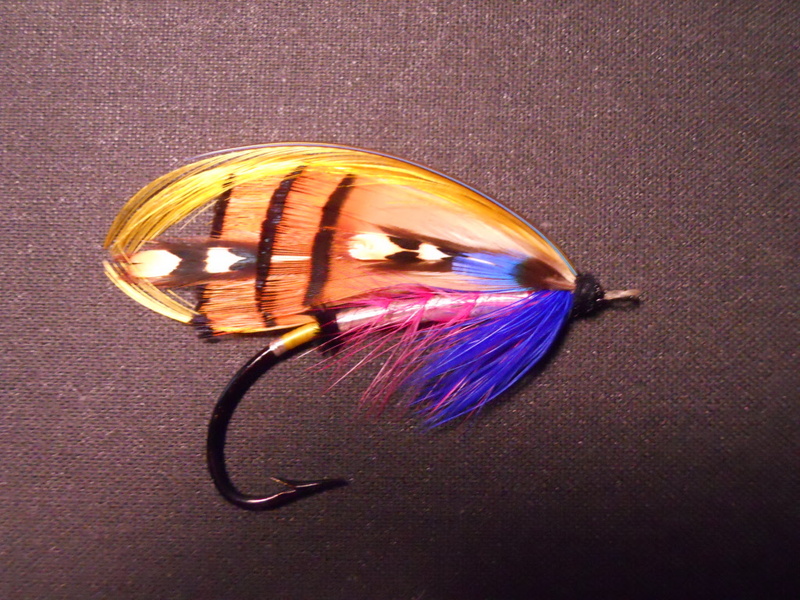 I get bored easily, and salmon flies encourage all kinds of sub-interests. For example, I had to learn about these materials I could not find. Ornithology was on my radar and I went from raising chickens- just some pets I had as a kid- to various pheasants and networking all sorts of bird breeders the world over to get my needs met. I was no longer in traditional streamer and wet fly land. My library grew. Once I obtained Judith Dunham’s Atlantic Salmon Flies: the Tiers and Their Art and Trey Combs’ Steelhead Fly Fishing I saw the modern aspects of the craft and learned about creativity. 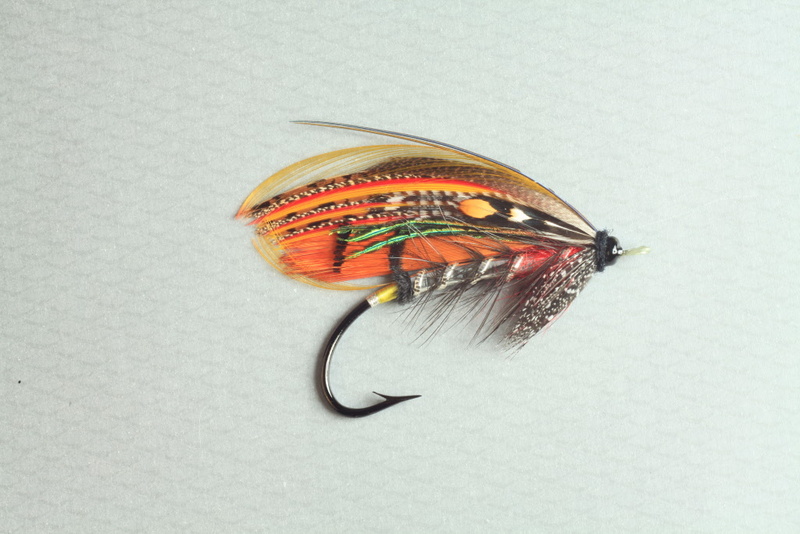 Paul Schmookler, friend and tying influence for almost 20 years, once wrote he is a “frustrated artist” not being able to grasp traditional art forms but in salmon fly tying could use the hook as his canvas and the feathers as his paint. Being able to only make hand turkeys at Thanksgiving, this struck a chord with me. While I was, and remain, a bit of a traditionalist, I began creating my own flies within classic confines. It seemed that the salmon tying community was turning all it’s attention to classic salmon flies for art’s sake and I followed suit. While I still like to tie a fly for the frame, nowadays I enjoy tying flies to look like antiques, many complete with brushed out wings and thick bodies. Ironically, I have fly fished very little and that was for trout. 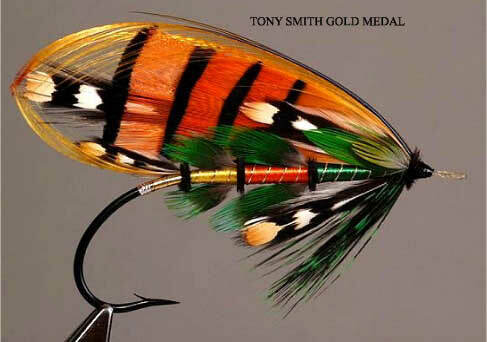 I never had any interest in fishing these classic salmon and steelhead flies. Around this time I was also tying commercially and tied so much I never needed a “real” job while in high school. I enjoyed tying “fishing flies”, and ran the gamut from General Practitioners to Zug Bugs for shops all over New England, including the legendary Hunter’s Angling Supplies. As many tiers go, I had a bit of a bug for perfection and over the years had to learn to be a “perfect non perfectionist”. Once I found this mindset, I came to enjoy the hobby much more, as opposed to when I was my own worst critic. I work as a psychotherapist and eventually published an article about this for Fly-Tyer Magazine. I am grateful to all the recognized contemporary tiers I had the pleasure to befriend and observe over the years at the New England area and United Kingdom shows. Charlie Chute, Paul Schmookler, Ed Muzeroll, Paul Seymour, Bill Wilbur and Bob Warren were all instrumental in my salmon fly tying. Through books I studied the flies of Syd Glasso, Walt Johnson, Dave McNeese and John Shewey. As a teenager ogling over these flies 20 years ago, I never thought I’d reach such skills. In 2006 I was flattered beyond all vocabulary when Dave took one of my classes. While I live in New England, the Pacific Northwest is my second home thanks to fly tying. I began travelling to Oregon in 2004 to spend time with Jon Harrang, another fine tier, fisherman and outdoorsman I met through Phil Castleman of Fisherman’s Furs and Feathers. Phil saw to it I had employment throughout college and grad school and made sure I always had good materials and new people to meet in the fly world. The first time I met Jon we went to the old Eugene show where I was introduced to Steve Brocco. A couple years later I received a call from a certain Rocky Hammond of the NWASFG, who explained that Steve had met me at Eugene and liked my work and invited me to tie for their group. Ultimately it is friends like Jon and Rocky that come to represent what a great hobby is all about for me. It is about forging new relationships and being exposed to new things. Thanks to my travels to visit my friends I began seeing a wonderful part of the United States and all it’s rugged wilderness. I have always been an outdoors-person but the Northwest was so foreign to my experiences thus far it called to me to explore it with a vengeance. Thus a healthy hiking and backpacking habit sprang forth where I was free to explore and form more new relationships. Tying flies once afforded me an absorbing, isolated past-time to avoid socializing. Ironically, it led to a life of networking, strong relationships and exploration. Funny how things turn out. Thanks, guys!